In today’s Court Report PNGi documents a land fraud masterminded by Mendi businessman Joseph Kobol, which has left disabled residents in Lae high and dry. The RPNGC anti-fraud squad must investigate this cruel act against a vulnerable community. Illegal land deals pepper our cities and rural areas. Executed with Lands Department blessing, lucrative state leases are illicitly given away by public officials at a discount to private parties and then sold off for a quick profit, often leaving a trail of destruction behind. Cue the case of Joseph Kobol, a high profile property developer and aspiring politician from Mendi. In 2011 his company Sanamo Construction Limited acquired a 99-year state lease over Allotment 2, Section 111, in Lae. The property provides critical care and support for disabled peoples. Community association, Homes for the Disabled, claims: “The signing of the MoA between Governor (Luther) Wenge and Sanamo Construction Ltd to sell the land was illegal and without our consent”. Video: Disabled residents cry foul over land deal, EMTV reports. Kobol hit back at disabled residents claiming: “There was no fishy or hidden deal on the allocation of that piece of land”. He also warned: “Interested people should not go to the media, because it will not solve this issue and I will sue them for damage”. In defence of the acquisition, Kobol argued he would build a modern hotel, supermarket, residential apartments and units, whilst also providing for the disabled community resident on the site. Kobol boasted the development would provide employment for 500 people. Six years later the National Court reviewed the Land Board’s decision to award the state lease to Kobol’s company. Justice Colin Makail published a damning decision. It recounts a land fraud masterminded by Kobol, which saw key portions of the property sold off to Indonesian investors, for a quick profit. Justice Makail claims this illegal deal denied disabled residents a chance to benefit from a package of support offered by an alternative developer, Mapai Transport. During November 2009, Morobe Province’s Governor recommended the award of a state lease over Allotment 2, Section 111 to Mapai Transport Limited. This would allow Mapai Transport to expand its business premises. In return, Mapai Transport agreed “to [help] house and pay for utilities for disabled people residing on the subject land”. Mapai Transport is a Lae based freight and trucking firm incorporated in 1992. It is majority owned and managed by Jacob Luke. According to the company’s last Annual Return it employs 230 people, with assets valued at over K53 million. To execute the agreement reached with Morobe Province’s Governor, the land was exempted from advertisement by the Lands Minister on 22 September 2010. The exemption was deemed by Justice Makail to be a legitimate and indeed laudable use of Ministerial power under section 69 of the Land Act 1996. 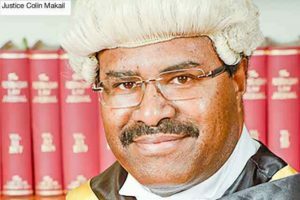 Justice Makail remarked: “In my view, it was an excellent initiative, a project worth investing in and land should have been readily made available by the Third Defendant [Independent State of Papua New Guinea] to realise it”. However, in an unusual twist the Land Board considered two applications for the state lease over Allotment 2, Section 111 – the first was submitted by Mapai Transport, the second was submitted by Sanamo Construction Limited. The state lease would be used for Business (Light/Industrial) purposes. Before the lease may be sold to a third party, the developer undertook to make K300,000 in improvements to the land. No reason was given for this unusual decision that contravened the Minister’s agreement with Mapai Transport. The National Court ruled this was a gross abuse of power under the Land Act 1996. Justice Makail argued that once a state lease is exempted from advertisement under the Act, the person or entity granted an exemption is entitled to be considered as the sole applicant, to the exclusion of all others. Nevertheless, on 3rd of February the Lands Minister Benny Allen awarded Sanamo Construction a 99 year state lease for residential purposes. Notably, this conflicted with the Land Board recommendation that a lease be issued for business purposes. Justice Makail notes this was a “glaring irregularity which renders the transaction questionable and suspicious”. The Court also noted the contrasting business record of both firms. Mapai Transport was a local business, with an established track record, strong financial position, and a history of corporate transparency. In contrast, Sanamo Construction was incorporated on 27 January 2010. Its registered office is in Mendi, Southern Highlands Province. Examination of the IPA corporate registry, indicates Sanamo has never submitted an Annual Return, despite being obliged to under the Companies Act 1997. As a result, it is impossible to state its assets, employees or purpose. Its only director is Joseph Kobol. Sanamo Construction’s 100% shareholder is the Sanamo Group (previously known by the name, Souths Organic Company Limited), whose owners are Joseph and Milcolm Kobol. According to the last Annual Return submitted by Sanamo Group it has no employees, and no assets. Against this backdrop, Justice Makail notes it is “highly questionable and suspicious” that Sanamo was the victorious applicant, given that in notable contrast to Mapai Transport which is a thriving Lae based firm with two decades of operating experience, Sanamo Construction was “incorporated a year earlier on 27th January 2010, its head office located somewhere in Mendi and having no business track record compared to the First Plaintiff”. According to the Court, during 2012 Sanamo Construction proceeded to subdivide and flip land plots to purchasers. It appears Sanamo failed to complete the required K300,000 in improvements before selling the land off. Judge Makail notes “there is no evidence that it put up improvements or did any development on it other than subdivision”. The Judge adds: “There is no evidence that the subdivision complied with planning requirements before it was subdivided”. Two of the subdivided plots – Allotment 22, Section 111 and Allotment 24, Section 111 – were sold to Polraven No.48. There is currently only one company registered at the IPA under this name. Incorporated in 2015, it is owned and managed by Joseph Kobol. The land was then resold by Polraven No.48 to Super Service Ltd in April 2013. Super Service is owned by two Indonesian nationals, Tjan Tjan Hia and Wahju Hanafi. Image: Following the fraudulent acquisition, the land is flipped by Sanamo Construction. All these events establish that the Fourth Defendant [Sanamo Construction] had one thing in mind and that is to acquire the subject land and to sell it for a windfall gain. There was never an intention to develop it. As a result, the Plaintiffs lost out big time. He adds: “Fraud has been committed by the Fourth Defendant [Sanamo Construction]”. Given the findings of fact by the National Court, a strong foundation has been established for a criminal investigation . The expertise of the National Fraud and Anti-Corruption Directorate is now needed in order to determine whether there is enough evidence to proceed with a prosecution under the Criminal Code 1974, which requires a higher standard of proof than in civil action. Two offences outlined in the Criminal Code demand particular consideration by the qualified authorities – namely conspiracy to defraud and misappropriation. Penalty: Imprisonment for a term not exceeding seven years. is guilty of the crime of misappropriation of property. 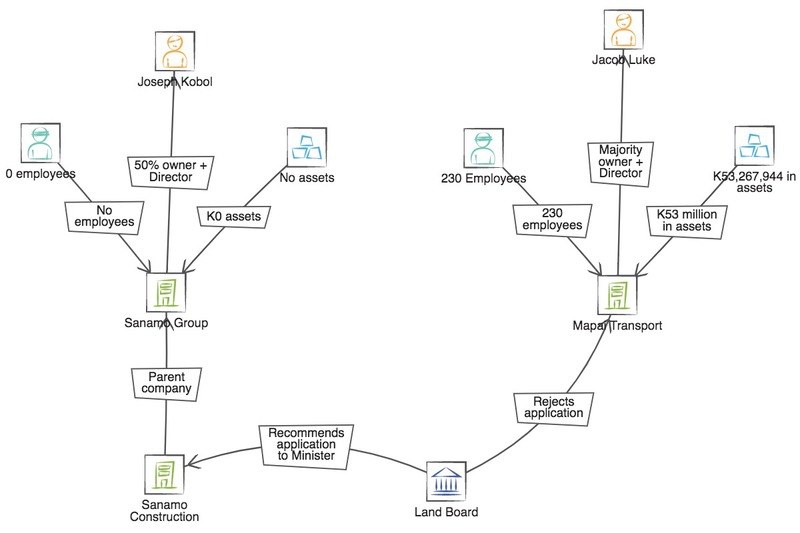 PNGi can report that the Joseph Kobol firm, Sanamo Group, has been implicated in another contentious land deal currently before the courts. Since 2015, NASFUND has been engaged in litigation to reclaim a state lease over land in Port Moresby’s 9-Mile area, which it claims was improperly awarded to Delta Corporation, a company majority owned by Australian national, Thomas Kennedy. Later Sanamo Group was added to the litigation, after a series of unusual transactions was brought to the attention to NASFUND. On 7 May 2013, Yawenaik Holdings Ltd, was granted a lease over Portion 1568, which abuts Portion 2123, the land which NASFUND is attempting to win back. Yawenaik Holdings is jointly owned by Kobol’s Sanamo Group and SMA Investment Limited. SMA’s owner is the Mineral Resource Development Corporation Managing Director, Augistine Mano, who has been profiled previously by PNGi. On 1st August 2013, the Second Defendant, Surveyor-General approved and registered a Survey Plan in Catalogued No. 49/3130 which was spearheaded by Yawenaik. That Survey Plan reclassified Portions 1568 and 2123 into Portions 3162 and 3163 respectively. It is alleged that it resulted in the encroachment of 46.55 ha of land in Portion 2123 thereby increasing the land size of Portion 3162 by 46.55 ha and decreasing Portion 3163 by 46.55 ha. Then on 16 August 2013, the Lands Secretary approved Yawenaik Holdings’ application to “consolidate Portion 1568 with Portion 3162 inclusive of 46.55 ha as surveyed and registered under Survey Plan Catalogued No. 49/3130”. Shortly after on 18 August 2013, the Secretary granted a lease over Portion 3162 to Yawenaik Holdings. Two days later the lease was transferred from Yawenaik to Sanamo Group. On 2 September 2013, a State lease was registered in the name of Sanamo. Subsequently, Sanamo sub-divided Portion 3162 into 393 Residential (High Covenant) Leases, which it is currently attempting to sell off. Given this sequence of events, the issues submitted to the Court was deemed serious enough “to warrant further consideration at trial and an injunction should lie”, which prevents the Sanamo Group from selling off the land.